It’s December of an odd-numbered year, which can mean only one thing in Texas: the reheating of the GOP Civil War as the party’s factions gear up for the start of primary season. Nowhere is this conflict more intense than in the Texas House of Representatives, where dozens of establishment conservatives will engage in pitched battles with dozens of movement conservatives between now and primary election day March 1 — with a few skirmishes raging on through the May 24 runoff. One thing all these Republican candidates have in common is that they almost to a person consider themselves to be an ideal conservative. They and their supporters differ however in terms of what they consider "ideal conservative" to mean. These different ideological worldviews in turn represent the principal political fault line within today’s Texas Republican Party. At the end of every legislative session, the state’s most prominent and influential movement conservative interest group, Empower Texans, and the most prominent and influential establishment conservative interest group, the Texas Association of Business (TAB), rate the members of the Texas House of Representatives and Senate. For each, a score of 100 represents, in their eyes a perfect legislative record. Here I examine the relationship between these groups’ ratings for the 2015 legislative session and House members’ 2015 Liberal-Conservative Score. Unlike the Empower Texans and TAB ratings, which are based on a limited number of handpicked roll call votes and other legislative acts, the neutral Lib-Con Score includes all non-lopsided roll call votes cast by the representatives in 2015. 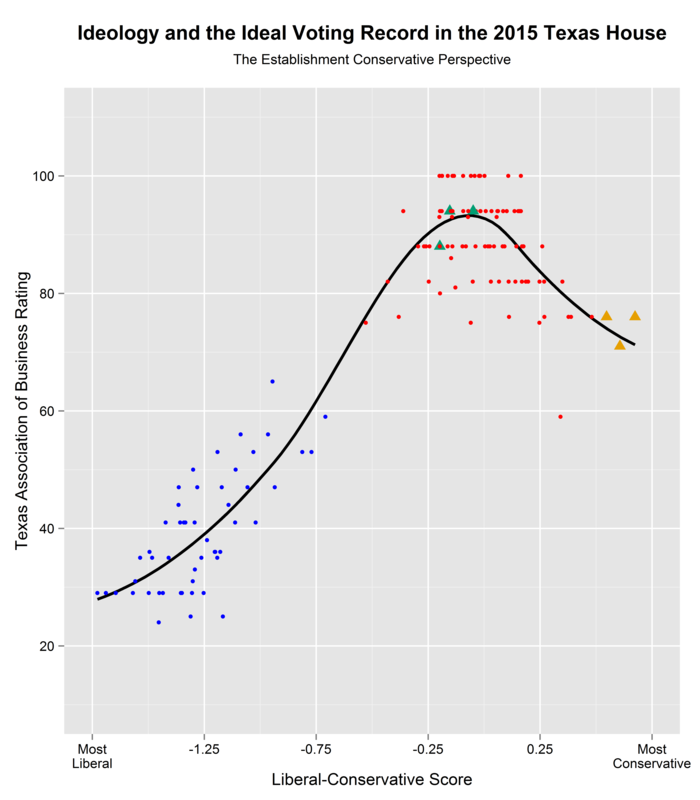 In the two figures, every representative’s interest group rating is plotted against their Lib-Con Score. A black trend line (a LOESS curve) traces the relationship between the respective rating and the Lib-Con Score from the most liberal (left) to most conservative (right) ends of the scale. A comparison of the two figures reveals the extent to which movement conservatives and establishment conservatives see the same legislative behavior through very different political lenses. From the movement conservative perspective (represented by Empower Texans), the more conservative a representative’s Lib-Con Score, the more positively he or she is viewed. Among Republicans, the black trend line in the figure rises at a very steep linear angle. For Empower Texans, in the 84th regular session there was no such thing as being "too conservative." The establishment conservative vision (represented by the TAB) is distinct from that of their movement conservative brethren. Most importantly, the overall relationship between a representative’s TAB rating and their Lib-Con Score is curvilinear, not linear. 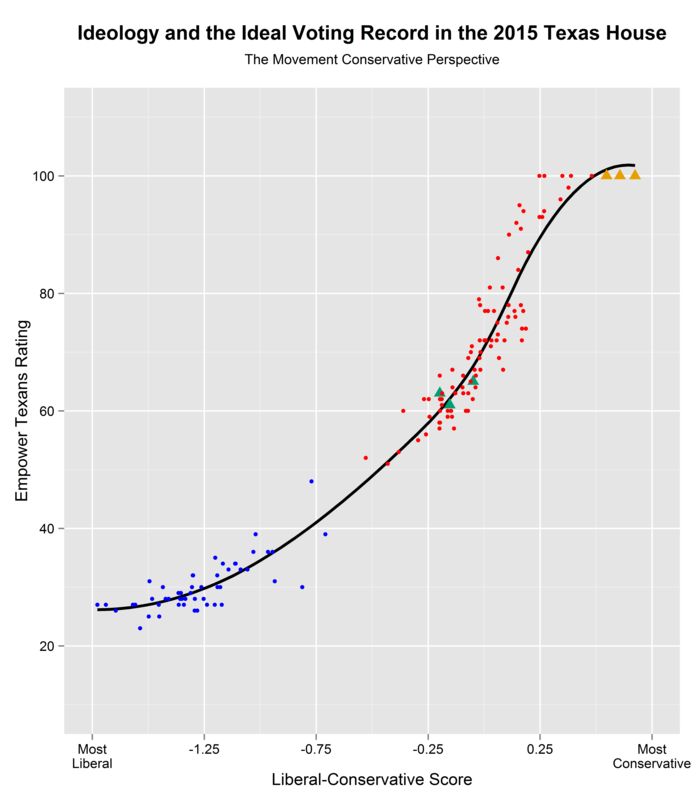 Moving from left (most liberal) to right (most conservative), the trend line’s rise is linear until it moves out of the Democratic side and into the Republican side of the ideological spectrum. At this point, the line begins to gradually reduce its angle of ascent before reaching a plateau. Until the plateau, on average, the higher a representative’s Lib-Con Score, the higher his or her TAB rating. But, after reaching the plateau, the trend line eventually begins to slope downward, with a higher Lib-Con Score from that inflection point onward on average associated with a lower TAB rating. For the TAB, in the 84th regular session there was such a thing as being "too conservative." These two different GOP worldviews can be poignantly illustrated by a half-dozen high-profile 2016 primaries involving Republican incumbents. 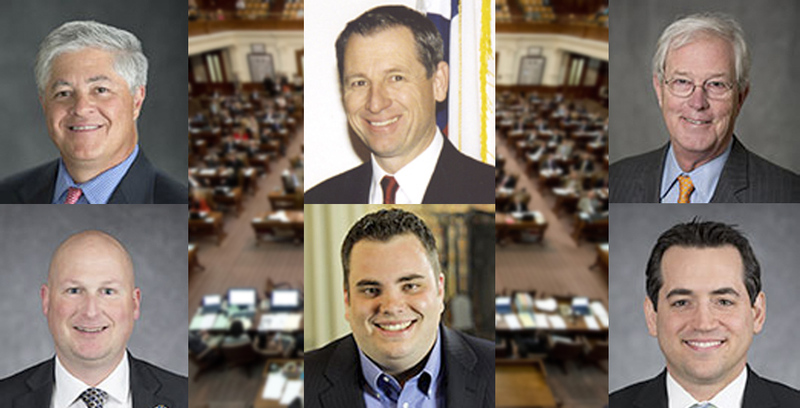 In the two figures, the legislators identified by green triangles are three establishment conservative incumbents who face movement conservative challengers: John Frullo of Lubbock, Byron Cook of Corsicana and Charlie Geren of Fort Worth. The gold triangles represent three movement conservative incumbents who face establishment conservative challengers: Tony Tinderholt of Arlington, Jonathan Stickland of Bedford and Matt Rinaldi of Irving. 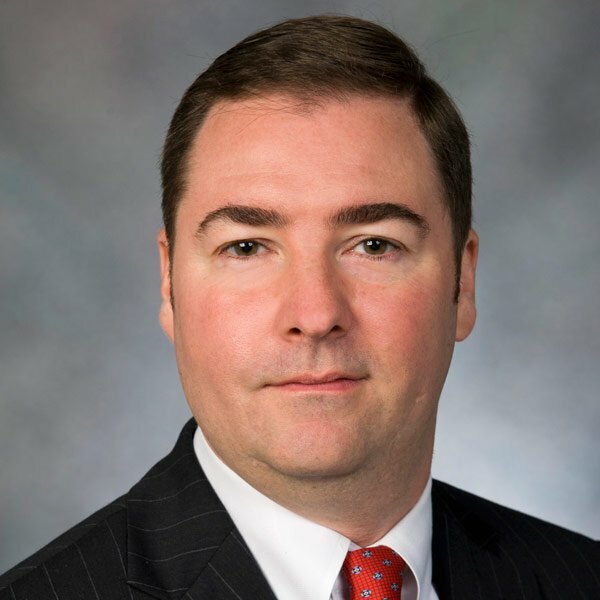 From the establishment conservative point of view, Frullo, Cook and Geren come close to representing the conservative ideal, neither too far to the left like the Democrats to their southwest nor too far to the right like the movement conservative Republicans to their southeast. Tinderholt, Stickland and Rinaldi do not conform to this particular conservative ideal, with voting records that, while preferable to those of Democrats, are suboptimal from an establishment point of view. Hence the establishment support for challengers in these latter three races, with the goal of electing representatives whose legislative voting profiles would more closely approximate those of Frullo, Cook and Geren than those of these three Metroplex movement conservatives. Of course, the reverse is true from the movement conservative vantage point. Groups that see Frullo, Cook and Geren as insufficiently conservative are backing challengers to these three incumbents, individuals they believe would have voting records closer to those of Tinderholt, Stickland and Rinaldi. In Texas today, the political and policy direction of the state is decided in the spring, not the fall. The extent to which the 85th Legislature in 2017 will tack to the left, to the right or maintain its present course will be heavily influenced by the results of more than two dozen battles between movement and establishment conservatives in the 2016 GOP House primaries.